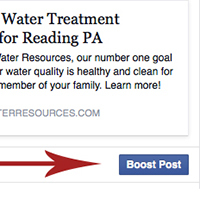 Boosting facebook posts is a great way to expand your audience reach on facebook. This option is available on business pages, and for a nominal fee you can reach a decent amount of people. You have the ability to target your audience through demographics such as location, gender and age and interests. Most times I feel these boosts are more effective than Pay Per Click solutions and reach more people for the price. You’ll see the option to boost your post in the lower right corner of your post after you have published it. 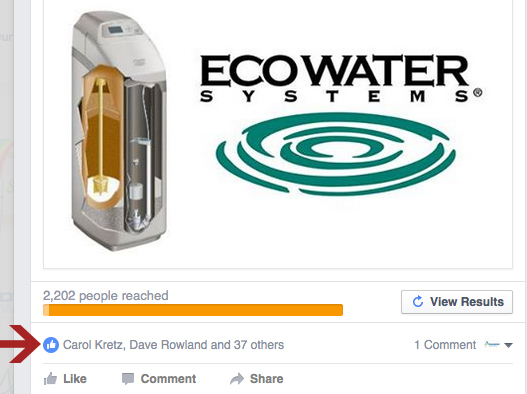 I have boosted posts for many of my customers including the one shown here, Advanced Water Resources, when targeting folks looking for a water softener or other water conditioning products. Click boost, and pick your audience targeting options and then decide on a budget that you want to spend per day. Facebook will give you an estimate on how many people your post will reach I have found you reach more people if you spread your budget out over a few days rather than all in one day. You tend to reach about 1,000 people for every $10 spent, but sometimes more and sometimes less. It all depends how many people like or share your post along the way. Simply click the link that shows the folks who have liked the post. 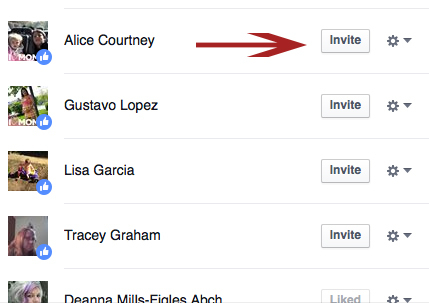 This will pop up a window that shows a list of people you can scroll through and if they don’t currently like your page, and have never been invited in the past to do so, you will see an “invite” button you can click to send an invitation to that person to like your page. Not everyone will respond to the invitation, but you are sure to pick up a few more likes that you would not received otherwise.